For employees, an important part of achieving our ultimate personal goal of becoming the best self we can be is to enjoy the work that we do. This experience no longer feels like a job, but more a vocation for which we take pride and joy in. In recent years, we have moved from the idea of working to live, where people see a job as a source of income and nothing more, to living to work. This is where people have a sense of fulfilment in taking part in a job they love. This is much like myself! The goal of viewing your job as a vocation is key to becoming the best self that you can be. This will give you the feeling that you have never worked a day in your life, due to the enjoyment felt whilst working. The primary goal relating to achieving self-actualization within the workplace is to turn your job into a vocation. To fully understand this idea, we must first define the differences between a job, a career and a vocation. In short, a job is a short term place of work, of which we are working to create a career out of. When an employee works in a string of jobs with no real purpose, long term happiness is rarely achieved. As such, a career is a string of jobs intertwined with one another with a certain end goal in view. A vocation however, is a job/career with a sense of purpose and realization. There is a clear end goal, coupled with a sense of enjoyment within the career they are undertaking. A good example would be to look at my personal goals for when I graduate from Lancaster University. Short term wise, I will be looking to become a Chartered Accountant. Therefore, I will undertake my ACCA exams once I qualify for them with the necessary experience required. Thinking career wise, I would ideally like to become a partner, or owner, of a firm in the future. However, due to my absolute obsession with football, I would love to work high up within a football club. This would represent my ideal vocation! We must consider that we all have different views of what a job, career and vocation is to each individual. We can change our minds at any time, and once we decide what a vocation means to one’s self, that we can change that view according to how we develop throughout our working lives. There has been much debate in recent years over whether the mix of the public and private spheres of life is good for organisational success and whether it helps or hinders the individual’s goal of self-actualization. The right mix can be beneficial for both parties! The introduction of ‘play’ into the modern business environment has seen a dramatic reduction in informal play activities. A prime example is the premise of ‘soldiering’ pioneered by F.W.Taylor in the 1920’s, acknowledged as the birthplace of informal play literature. An increase in workforce productivity in recent times shows that Taylor’s theory may have lost its relevance. Examples of the mix of work and play include a healthy and vibrant workplace, to the use of outdoor meetings. The use of outdoor meetings should be promoted even more with the current heat wave we are experiencing! As a result, this makes self-actualisation and the eventual undertaking of a vocation an encouragingly achievable aim. Whether our managers see us in an Apollonian or Dionysian light, they know that we want to be our best selves regardless. Hence this integration of work and play backs the modern theory that we now live to work. Play within the workplace is evidently key to maximising happiness for employees. Consequently, they maximise efficiency for the firm they operate within. This is mainly due to play within the workforce ensuring that we release our inner creativity. Therefore, this makes as much space available for employees to innovate to better achieve the firms goals, and again potentially turn their job into a vocation. A job can never really become a vocation unless you have some sort of affiliation for the job you are undertaking. Therefore, the importance of loving the work you do on a daily basis cannot be understated. I repeat this saying due to its importance, if you love what you do, you’ll never work a day in your life! Doing something you love is critical to becoming your ideal self. This will in turn give you the best chance of achieving self-actualisation. Obviously there is more to achieving this goal than just doing a job that you love. However, it certainly doesn’t hurt, so get out there and be the best you can be! 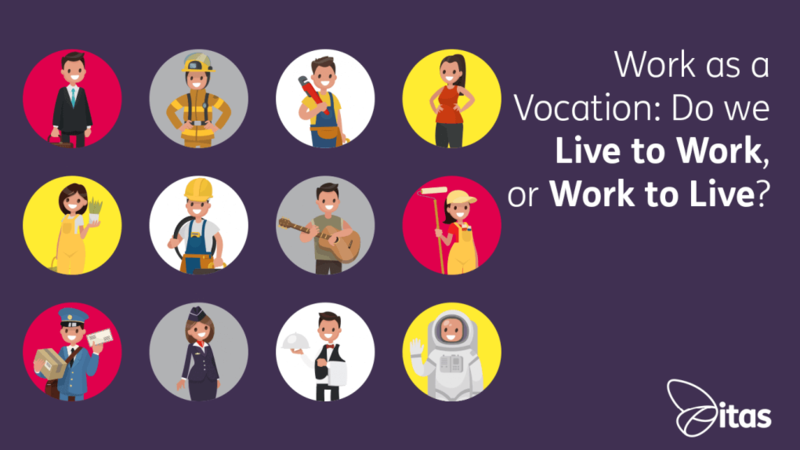 Home » Sage Blog » All Sage Blog Posts » Work as a Vocation: Do we Live to Work, or Work to Live?